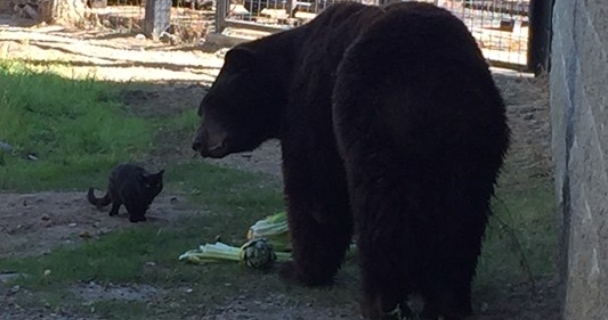 'Little Bear' a feral black cat and Sequoia a 550-pound bear might not seem like ideal companions, but over a matter of months the two have become close pals. Jill Faust, senior lead zoo keeper, said Little Bear just 'appeared' one day and has stuck around ever since. 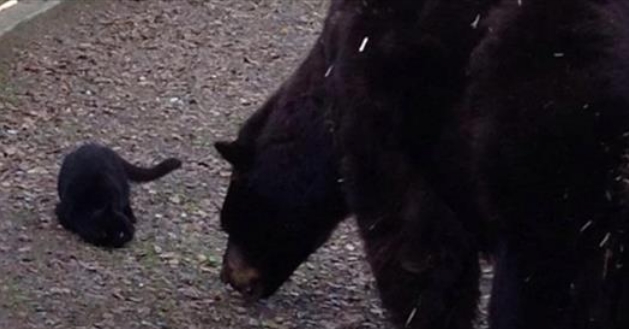 'Every morning we scatter dog food for the bears and she started coming into the exhibit and eating the dog food,' Faust told ABC 10. Often they are seen lounging near one another in the shade or snacking on dog food together. The pair doesn't seem to cuddle up, but they stay in close proximity. 'Sequoia walks right by her, she'll walk right by Sequoia and they'll stay pretty close to each other,' Faust said. Sequoia and Little Bear are both older animals and are slower with their age. This could be why they are such excellent companions for one another. Responses to "An elderly feral cat comes to visit a lonely old bear at the Zoo"
Great, "we can all find a way to get along." But what about the fact of this bear being in captivity and in such a small enclosure when we know that bears are animals with large habitats. Sure, it's great the cat, named Little Bear", has come to stay and offer some companionship to Sequoia, but captivity and gaping at animals in captivity are just not acceptable. It's 2016. Open the cages. Jodey: I agree with you. If they go extinct, so be it. Caging for future generations make no sense to me. We killed them all so let that be. But to open the cages would be more than cruel. Keep them until they die but DO NOT replace them. Bears are usually found without mothers as cubs, they aren't captured for the zoo. I agree this bear needs a comfortable space with lush green surroundings. Sad to see them confined like this.